As I mentioned last week, Google was planning on making it easy to embed its maps onto websites without knowledge of the API. Now the dream is a reality. A Google Press Release announces its official launch and highlights some practical applications of the maps. * business owners can now add a map of their business location to its website, with links to directions and more information on Google Maps. * bloggers can now write about a restaurant or a place they have visited and embed a map of the location in the blog post itself. * individuals can update their personal websites by publishing maps of geotagged vacation photos or creating sophisticated maps mashups using the simple tools available in the My Maps tab. Cre8asite Forums members are quite happy with the news. I mean, seriously, how much easier can it get than this? 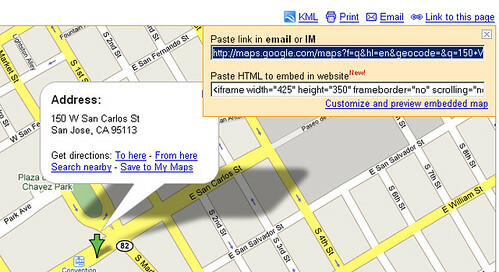 To embed a Google Map, users simply pull up the map they want to embed - it can be a location, a business, driving directions, or a My Map they have created - and then click "Link to this page" and copy & paste the HTML into their website or blog. See the second line with the iframe embed tag? That's it!